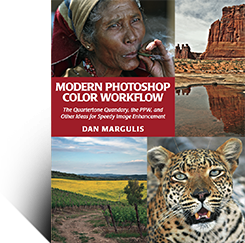 This page records known issues with both Modern Photoshop Color Workflow and Photoshop LAB Color, Second Edition, as well as supporting materials, with resolutions indicated when available. 12 April 2013, early versions of Photoshop only: a reader reports that the Sharpen 2013 action doesn’t delete all scratch channels correctly. The reader is using Photoshop CS3, and therefore is not using the PPW panel but rather the Actions palette to invoke the action. Resolution: The action accesses a command that is not implemented in Photoshop CS3 (and possibly CS4, and presumably older versions). A new version of the action that bypasses the issue was posted in the appliedcolortheory newsgroup on 17 April and is now available here as well. Again, this is only needed by people with older versions of Photoshop. Anyone using the PPW panel is unaffected. 10 November 2016. We are not aware of any issues with the panel, which now runs in any version of Photoshop between CS5 and CC2017. Many user-specific actions can cause problems, however. If you need to troubleshoot a panel issue, click here for Photoshops CC2014-CC2017 or here for Photoshops CS5, CS6, and CC (original). 23 April 2014, a reader is unable to open the file CH03 Fig 3-12 sm-hockey. Resolution: The file is missing the appropriate .jpg suffix, which the reader was advised to add manually. 3 April 2013, a reader points out that the original Grand Canyon image that opens Chapter 4 is missing from the downloadable chapter resources. Resolution: 3 May 2013, a revised download is now available. 8 August 2013, on p282 a reference to removal of halos incorrectly states the Figure that shows the problem. It is Figure 10.19B, not 10.19A. 3 July 2014, a reader complains of lack of clarity on page 292 in my description of how to produce a two-layered file in which the top layer has been multiplied three times. As this is in the advanced section there is some question as to whether a fuller explanation is needed. However, for completeness, here are four of the many ways to accomplish this, starting with a single-layered file. 1) Duplicate the background layer, than Image: Apply Image to the duplicate, source being itself, mode Multiply. Then repeat the Apply Image with the same settings. 2) Duplicate the background layer, then Image: Apply Image to the duplicate, source being the background, mode Multiply. Then repeat the Apply Image twice, using the same settings. 3) Duplicate the background layer, then change the duplicate’s mode to Multiply. Add two more duplicates of the duplicated layer, for a total of three new layers each set to Multiply. Use the PPW panel to Add Composite Layer, then delete the three multiplying layers. 4) Duplicate the background layer, then change the duplicate’s mode to Multiply. Add two more duplicates of the duplicated layer, for a total of three new layers each set to Multiply. Duplicate the background layer one more time, placing it beneath the three multiplying layers in Normal mode. Turn off visibility to the background layer itself. Then Layer: Merge Visible, and restore visibility of the background layer. 8 May 2013, on p333 a reference to “Postcard 12.15″ should read “Postcard 12.14″. 27 November 2013, on p402 a recommendation as to noise reduction has been changed; read about it here. 10 November 2016, in the first column of p412 the two references to Figure 15.4C should change to Figure 15.3C. The references to Figure 15.4C in the second column are correct. Q. Why should we be cautious about blending the red or the blue into the green? A. The blue and red channels are always noisier, so blending one of them into the green—which is the most important contrast channel—needs to be done carefully if at all. Q. After the Darken Sky action runs, why does the Channels palette show five channels (in addition to the RGB composite) rather than four? A. The action adds an alpha channel to the original three RGB. But the alpha channel is loaded as a layer mask, which counts as a fifth one. The fourth and fifth channels are, for the moment, identical. 20 April 2013. On p435, Review and Exercises section for Chapter 10, the third bulleted item doesn’t belong there. No text is missing, and the statement is accurate enough, so there’s no harm. 8 October 2015. In the curves orientation box on p157, the top graphic is mischaracterized. It is an LAB curves adjustment layer using the interface introduced in Photoshop CS4, with the Photoshop default (for RGB and LAB, that is) of darkness to the left. Beneath it, a curve that would be applied to the mask on that adjustment layer defaults to darkness to the right. 19 October 2015. On page 128, second paragraph, reference is made to a downloadable figure that allows one to experiment with how different L values affect the gamut of printable colors. The correct number is Figure 2.6. 28 July 2015. On p188, Figure 8.1B is mislabeled as 8.2A. I’m running Win/7 & PS CS/6e. I downloaded the PPW for Win and got a compressed .rar file. I can’t find anything in the .rar file that will install PPW. In spite of your first video, installation is not so easy. How do I really install this product when unlike the video, there is no icon on my desktop. Our download files are in .zip, not .rar format, so this .rar was not downloaded from us. Harrumph! I did download from this web site! I tried to download it again, but it apparently is no longer available in either the Public or the Private resources areas of your site. I do not have WinZip on my machine so .zip downloads get converted to .rar format. WinZIP costs $30 which is 50% of the cost of the book which I consider to be exorbitant given that you were not forthright in this requirement in your pre-ordering information. Trying yet again to download (FROM THIS SITE) I can not find the download link. Where have you moved it? 1) We have not moved the download anywhere, it’s where it’s always been, you can access it by clicking Resources in the menu bar from any moderncolorworkflow.com page. 2) Zip is the universal interchange format for compressed files and has been supported natively by all Macintosh and Windows computers for around ten years. There is no need for additional software in Windows 7 to decompress .zip files. 2c) There are various places on youtube.com to see how it is done, e.g. 3) If these are not satisfactory, you should be able to find help locally to assist you in unzipping. Or any friend who downloads a lot of files should be able to demonstrate it to you. Over 10,000 Windows users have made this download without difficulty in decompression. 4) We cannot offer support for basic computer operation. If you cannot resolve this problem with the above information, I offer to make uncompressed files available on a private site for you, but this will be more timeconsuming for both of us, so I would ask you to try the above first. I have just returned from those two (Video and Private) pages and the download link is not there? I have removed .rar from my system and stand ready to try the windows decompress you suggest, but I can’t get to the download area on your site? Do you, perhaps, block a second download once I’ve done that before? I have alerted Ledet Training to your situation (have no reply from them as yet) in case they are able to assist. OK, I was able to get the download and unzip it in Window as instructed using the Extract all option. That created a folder C:\Users\Jim\Downloads\PPW-3-win and when i clicked Extract I got an error message: Do you want to copy this folder without encryption? A problem is preventing this folder from being encrypted. PPW 3_win_installer Type: File folder…” Taking the Yes option, I get a folder ~/PPW-3-win/PPW 3_win_installer which contains PPW_Tools_3_EN_win.ZXP. I can not do anything with this file. As for your suggestion of getting a technical consultant to help me: I am the technical consultant people hire for help. I’ve got over 30 years of software development as a programmer, solutions Architect, and college level IT faculty experience. I know what I’m doing…. We are getting very close to needing someone with similar skills on your side of this conversation. Something is broken here and it needs to get fixed! When I tried to open the ZXP file in Photoshop CS6e, I got the message “Could not complete your request because it is not the right type of document. Just thought I clarify that. The .zxp file is the installer, not a Photoshop document. If you double-click it, it should bring up Adobe Extension Manager, which is how the panel gets installed. If for some reason this does not happen, you can install by opening Adobe Extension Manager and choosing the option Install, and then navigating to the .zxp. That worked! Took a few minutes to discover that I needed to go to Window>>Extention>PPW_Tools_3_en That got the panel up! This was not the easy one click install in Dan’s video. OOK, I have the panel, now to see what other trouble I can get into. Next worry: Do he actions conform to the principles of ‘Non-destructive editing’ or is image information lost in these actions? To the extent that it even has a meaning, the word “nondestructive” can only be understood in the context of an entire workflow. If you’d like to discuss the topic with others who are familiar with the PPW, you should sign up for the appliedcolortheory newsgroup at http://tech.groups.yahoo.com/group/colortheory/. Unless I’m humiliatingly missing something, in the Notes & Credits appendix for chpt. 10, p. 435, the third bullet point for the Review and Exercises Section describing Option-splitting the Blend-if sliders: I don’t think that goes with the corresponding third one on p. 262 talking about gathering pictures of people and running Bigger Hammer on them to unpleasant effect unless perhaps reducing Opacity to circa 20%. I’ll bet it should have landed somewhere else, but right now it’s not immediately obvious where. George, it just looks like it’s a stray piece of copy. The third Review & Exercises item on p.262 doesn’t require an answer. Nothing is missing, therefore, on p.435, there’s just an item where it shouldn’t be. Typo: Chpt. 12, p. 333, 2nd column, 1st full paragraph: Reference to Postcard 12.15 looks to have meant 12.14. OK, George, thanks for both of these. – while extracting the ‘Zip’ file you may see messages about ignoring encryption – select ‘yes’ and click on the ‘apply to all’ button so you only have to do it once. I downloaded the resource images and I’m trying to follow the same color corrections described in the book about ch3. Ok, when I open the images they haven’t a color profile but which color profile have I to assigne just to get the same values showed in the book? The files are as they were received from the photographer. If no profile was provided, you would have to guess at it, just as you would in real life. When an RGB file arrives without a profile, I always assume that it is sRGB, and I recommend that practice to others. It may not be right, but it is the least likely choice to do harm. Grazie Dan for your answer! My problem is that I endeed assigne srgb profile to the “World’s Fastest Animal” photo but I get different numbers from the fixed reference points (alredy done in the picture). For example, point #1 in the book: R 199, G 215, B 233 – mine: R 199, G 215, B 232; point #2 in the book: R 92,G 95,B 109 – mine: R 87,G 91,B 103. I take the eyedropper with 3×3, but the numbers are slyghtly different also in 5×5 and single point. I don’t understand this difference. After the assignment I didn’t convert to any other profile. These small variations don’t affect the way the image would be corrected. They exist because some of the resource files have been downsized before we posted them, in order to discourage commercial re-use; also some versions of Photoshop have slight variations in how the values are computed. In this image of cheetahs, the book’s values were obtained when the files were the size needed for half a page, but the archives files are the size needed for a third of a page. Since the image has been resampled, the values won’t be quite the same. What is the fix for the stalling of Sharpen 2015 in PPW4? David, as far as we know this problem was resolved with the release of version 4.0.5 on 11 December; we have no reports of recurrence since. If you don’t have it, you can download it at http://www.moderncolorworkflow.com/blog/ppw-tools-panel-version-4; if you do have it and you still have the problem we need all the details as spelled out on the troubleshooting page. Can I download these videos ? Susan, the videos are not available for download. We have no other reports of Firefox or any other browser being unable to display them, so I would recommend trying a different browser/different computer. …but I think it involves mainly security updates), and I couldn’t get the videos here to play, either. My symptom is that the player window’s “Loading” indicator flashes indefinitely, without ever starting the video, and my little network utility doesn’t show anything streaming over the Internet. However, I relaunched Firefox in “Safe Mode” (quit, relaunch while leaning on your Alt or Option key), and the videos here play just fine. Ergo, we probably have some Firefox third-party extension conflict with the video player on this site. There’s your workaround for now; only a minor inconvenience. Meanwhile, I will try to set some time aside for doing extension conflict isolation, and will report back here when I find the culprit. …then the videos here will play again. …and copy down the list and post it here, and I will try to identify the one that’s causing your problem. I am sorry if I do this twice but I can not see my post. Is it possible that you are sending me the manual instruction to make the ppw panel going. It is because the field “Extension” stays grey out no matter what I am doing. PS I am very lucky that I have discovered your workflow! I am now on Chap 6 of the new LAB book and have found what I think are two minor errors. Reporting them here at Dan’s suggestion. Info for others and for Dan to verify they are errors or perhaps I am incorrect? 1. page 82 Fig 4.3 (font here does not show 4 ‘decimal point’ 3 clearly) the small Layers window screen grab example: Here and on other pages (84 & 89) referring to this layers window, for the layer image shown, that includes the L channel as a mask, AND the opacity at 50%. My understanding from reading is use 100% when using the mask (altho OK to reduce as needed) and per 4.3B, with no mask, use 50% opacity. Correct? Seems like the one screen grab was meant to show different stuff for different purposes and went awry. 2. page 90, last para. says see Fig 4.8A (should be just 4.8?) but there is only Fig 4.8….which seems to be all OK.
Doug, thanks for these suggestions. The corrections of Figures 4.8 and 8.1 are noted. The screen grab you have referred to is from the Color Boost action, where the default is not 100%. The text you refer to talks about when you are building the layer from scratch. The problem is solved. During installation of PPW PS should be launched in AdminMode. I could kick myself for not picking-up on this in my beta reader annotation, because I was already in that p. 312 caption, where I see that you adopted my suggested change to the caption’s second sentence. An excellent example of your admonition to not let fixing one problem let one lapse and overlook another problem nearby! @George, Thanks for these two notes. I have finally got around to checking and you are right in both cases. Very minor, probably not worth a special mention above, but I have corrected the files for any subsequent reprint. The beta readers never saw this final revision of the Curves box, which added the graphic examples. George, yup, you are correct, I have made a note on the main page. Thanks. I missed this during the beta reading, too. In my PS CC (2013)/PPW 4.05, the default is 30%. Did it change to 20% with installations on newer versions of PS? George, there are several possible defaults for the CB layer: 75% if you are running the CB action, 30% if you are running the MMM + CB action at its defaults, and 20% if you have configured it to have an MMM Saturation layer. I think I found the answer on p. 80 of PPW book. You must have applied Image: Adjustments>Curves while selecting just the red channel. It leaves no trace, or at least no curves layer. A question about Options on some of the PPW scripts. I am running PPW 4 ( The August 15, 2015 edition) on Mac OS X 10.10.1 and PS CC 2015 the December “update” ( really a downrate.) When I Opt + click Bigger Hammer, or H-K, or any other script I never get the options that you describe. Why is this ? Also I cannot address the “creative” options for the MMM script described in a Video. Incidentally how do I determine what version of PPW I have installed ? Perhaps this lack of options will be fixed in the next PPW update due out in a few days. If not would appreciate some guidance as how to address the options because OPT + click doesn’t do it. Thanks again for the wonderful PPW panel software that has opened up a totally new creative outlet for my work. PHL, These are known issues with the latest Photoshop releases. In the next few days we will be releasing panel version 4.0.9, which works around them. Watch for it on our resources page. You can find out the version of Photoshop in the window that opens when you execute Photoshop: About Photoshop. Thanks for the kind words about the panel. Love your books and ColorTheory forum. Can you add to the PPW color guide help file to list not just good Lab colors, but also common close, but bad colors, often done by MMM/CB, if not limited by user. In other words how to know when greenery (example) is too green or too yellow? What Lab numbers tell us the color is now wrong? Same for the other categories. Maybe a reply in the ColorTheory forum if a new book not imminent? Doug, I’m not sure what you’re asking for. The panel states generally what the desired ranges are for a variety of common objects. If they measure as not falling within those ranges then they are wrong, at least in theory. For example we say that in natural greenery the absolute value of the B should be somewhere around 1.5-3.0x that of the A. It follows that if the ratio is higher than that the green is too yellow and if it is lower than that it is too blue. the site for the downloadable resources, can you please provide a link. Instructions for the download are found in the box on page 5 of the book. Ed Wright - 21 days 3 hours : Is there no way to purchase the second edition of Photoshop Lab Color? I own the first edition and I would love to purchase the second edition. Dan Margulis - 25 days 17 hours : Bill, I’ve replied offline with my address. Dan Margulis - 45 days 22 hours : Peter, I’ve replied offline. Dan Margulis - 45 days 22 hours : 时间去那儿了, the Variants Manager has not yet been released. Peter - 48 days 19 hours : Hello Dan! Big fan of your writing. Is there a way to contact you directly by e-mail?